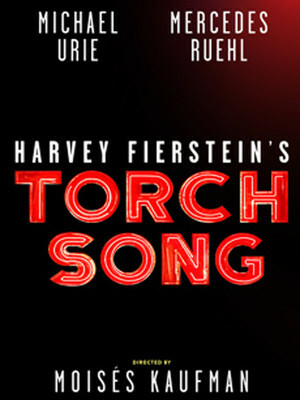 TORCH SONG by Harvey Fierstein, on Broadway, beginning October 9, 2018 | The Drama Book Shop, Inc.
Then Broadway's Hayes Theatre, 240 West 44th Street, beginning October 9, 2018. Opens November 1, 2018. Through January 6, 2019. Michael Urie and Mercedes Ruehl will reprise their roles as Arnold Beckoff and his mother. Moisés Kaufman will once again direct. It’s 1979 in New York City and Arnold Beckoff is on a quest for love, purpose, and family. He’s fierce in drag and fearless in crisis, and he won’t stop until he achieves the life he desires as a doting husband and a Jewish mother. Now, Arnold is back…and he’s here to sing you a torch song. The Tony Award®-winning play that forever changed the trajectory of Broadway returns for a new generation. With Michael Urie and Mercedes Ruehl. The 2017 Off-Broadway production featured Jack DiFalco, Ward Horton, Hope Radja and Michael Rosen.